That angels still watch and sometimes send us a 'rose'  A gift to remind us that Heaven still knows..."
Matted Size: 14" x 11"
Image Size: 21 5/8" x 19 1/4"
This open edition print comes deluxely matted and framed in an ornate gold frame. 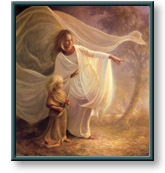 Heavenly Hands copyright © 2001 by Greg Olsen is prohibited from being copied. All applicable copyright © laws apply and are reserved by artist Greg Olsen.